It’s good to have wine friends. My friend Bonnie‘s husband Ted is a bit of a wine guy. When not busy being a neurologist, he does podcasts and was a founding partner of a wine importing and distribution business. I love going over to their house for drinks because there is always good wine and even better, Ted likes to pull out new things for me to try. Like the bottle of Georgian wine he sent over for my birthday a few years ago. I should say here that I like hanging out with them for many other reasons, but the fact that I increase my wine knowledge every time I drink with them doesn’t hurt. Last night was no exception. 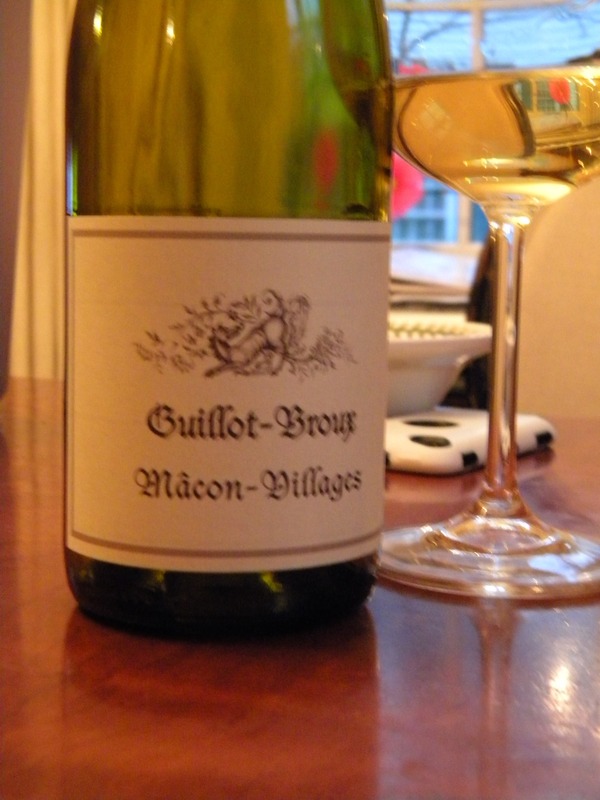 We started with this absolutely lovely Guillot-Broux from Mâcon-Villages, a white Burgundy. Mâcon-Villages is an appellation in the Southern Burgundy region of France, part of the Mâconnais district. Just as all the red wines from this region are Pinot Noir, all white wines produced in this region are Chardonnay. Not Chardonnay as in those overly oaked buttery versions from California, the Chardonnay from this region is far different thanks to the Terroir as well as different approaches to wine making. Many of these wines never see oak. As a result, the wine is generally medium bodied, crisp and fresh. Mâcon-Villages are considered to be a slightly better wine that the ones just labeled Mâcon. Some of the better Mâcon-Villages will have the village name on the label as well, such as Mâcon-Lugny. Here’s the best part of Mâconnais wines – they are considered some of the best white wine buys around, generally retailing for under $20/bottle, which is my favorite price point. So here’s your takeaway from today’s lesson – white Burgundies are Chardonnay. They are quite nice and in our price range. They pair well with fish, white meat, lemon sauces and other tangy fare. This particular wine was slightly fruity, reminiscent to me of apples, just a touch of minerals and incredibly smooth. It was a lovely bottle to sip on as we sat inside Bonnie’s house pretending it was spring while watching snow fall yet again. 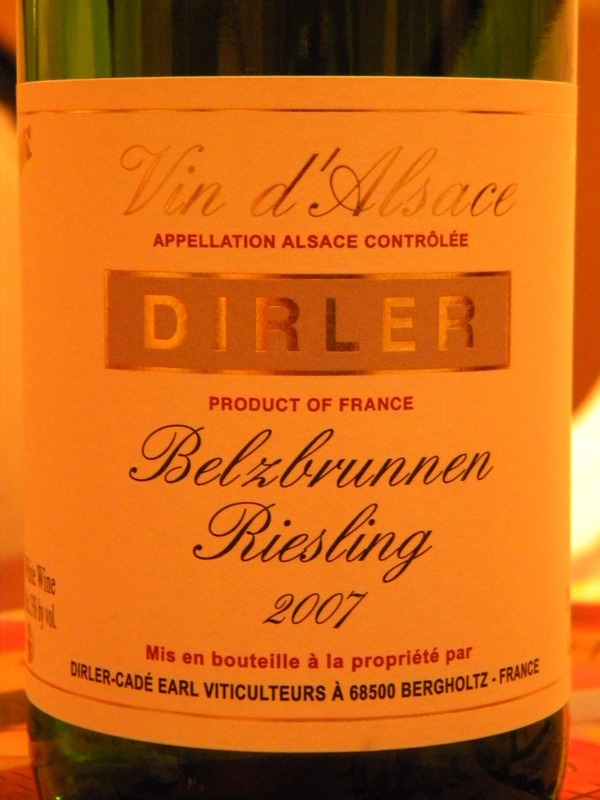 When Amy arrived, Bonnie ran down to their wine cellar and grabbed another bottle, this time a French Riesling from the Alsace region, Domaine Dirler-Cadé Riesling Belzbrunnen. This region is located in northeastern France adjacent to Germany and Switzerland. Along with the nearby Lorraine region, Alsace has changed hands between France & Germany a few times over the years. Consequently, there is a strong German influence, both in the wine bottles used (taller, long necked bottles also known as flûtes) as well as the grapes grown. Riesling is a German grape, one that is described as “terroir-expressive”, meaning the resulting wine is greatly influenced by the soil in which it is grown. Riesling are commonly thought of as sweet wines. Which they can be. But not all Riesling is sweet and Alsace Rieslings are most certainly not sweet. In fact, they are considered to be among some of the better white wines around. Unlike most whites, Alsace Rieslings get better with age, developing a complexity and acidity as they go along. They generally have a fruity aroma with a firm, dry taste. Interestingly enough, some Rieslings may develop what has been described as a “petrol” note. It can be off-putting, but it actually means it is a quality wine. Dry Alsatian Rieslings have a crisp acidity that gives them great pairing versatility. As a result, you can pair these wines with rich dishes such as pâté, fish, chicken, sausage, creamy, stinky cheeses and heavy rich sauces such as Hollandaise. Amy noted this wine had caramel and apricots on the nose with an absolutely perfect finish. I really couldn’t describe it better myself and so I shall not try. It’s ALWAYS good to have wine friends!